David Hancock explores the space between physicality and psychological space using a hyper-realist technique. His exhibition ‘Time to Pretend‘ (The Hub, Manchester 3rd – 18th March 2011) elevates the ordinary to the decidedly extraordinary. 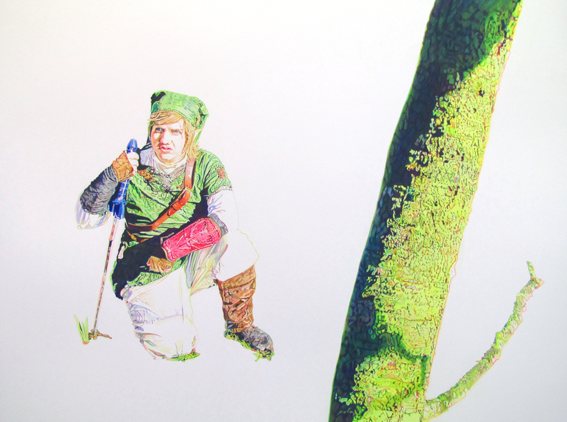 Gaming and urban folklore are fused together in these intricate drawings. This realism was made even more extraordinary by the actual presence of his subjects (his friends) wandering round the exhibition on opening night, making their likenesses in these portaits all the more startling! The work is escapist – yet it plays with reality – a moment in time. 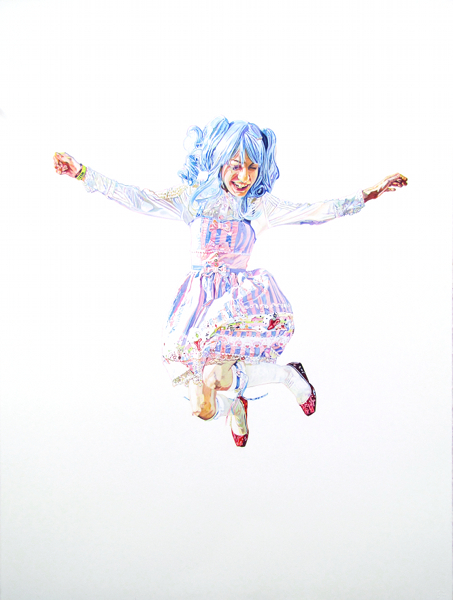 The artist uses photographic images which he then translates into a narrative via little pixel like brushstrokes (or in this work, pencil crayon on paper). The results are disconcerting – as the Gamers are simultaneously revealed, yet hide behind these roles, providing the viewer with flashes of revelation which are tantalising. Hancock documents escapism in our youth subculture and whilst also referencing utopian vision. The reality and unreality of these are what the artist plays with. 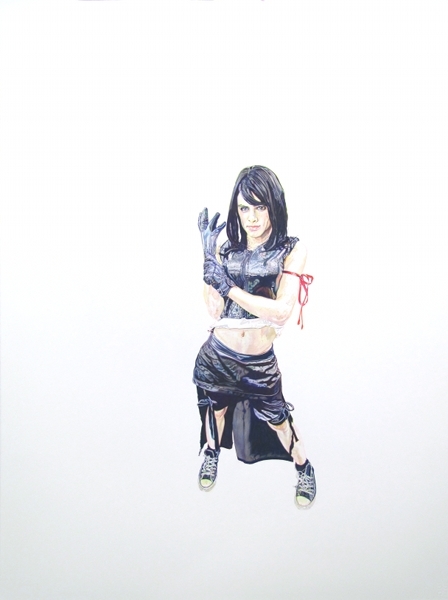 Escapism through computer gaming and role-playing meets utopia and in the Gaming portraits the individual is attached by an umbilical cord to their controller. Hancock calls these works double portraits as in a sense he is simultaneously showing the two worlds of their personalities as they immerse their selves in their Game playing and their character roles. The work, though contemporary has its roots in Romanticism and the utopian visions held by Ruskin, Morris and the Pre-Raphaelite. The characters take on special powers, hints of which are shown in the portraits as they fly through time to become the hero’s of the now. An interesting and thought-provoking exhibition by Hancock. I shall look forward to seeing his other larger scale work. To really appreciate these images please go to the artist website where larger versions of these works, including many others can be seen. 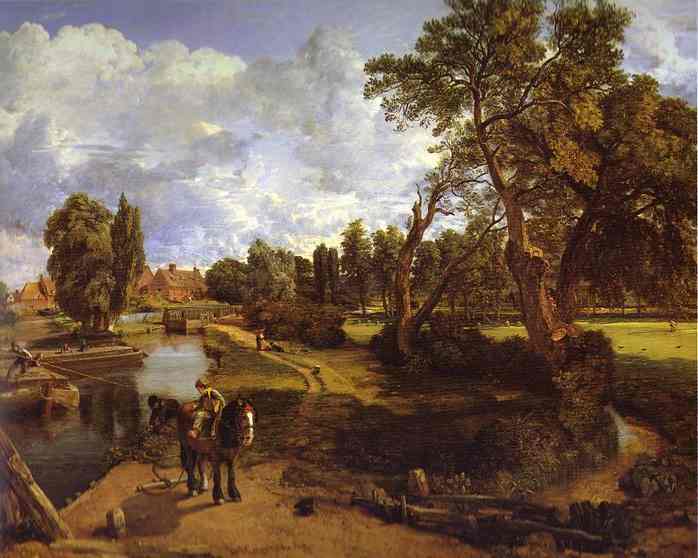 The English Landscape painter John Constable (1776 – 1837) also had a hard time with regards to his art being taken seriously. He tried to gain respectability for Landscape painting, trying to get it accepted as a proper subject matter. 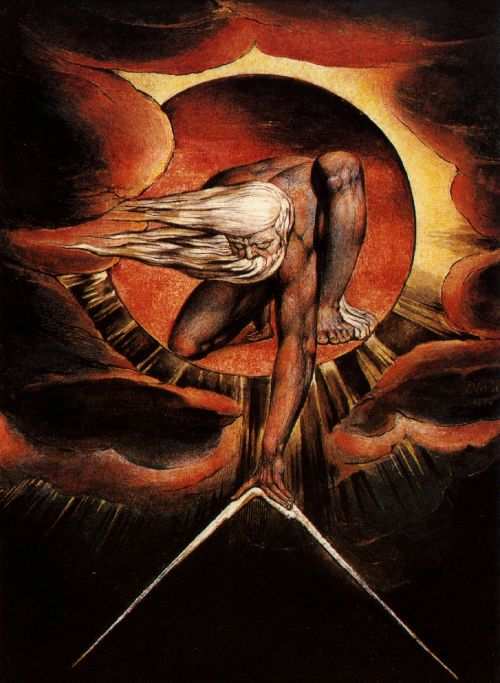 He believed that ‘God Almighty’s sunlight’ was as full of moral and spiritual values as a scene from ancient history. He was about fifty years ahead of his time. Although rejected in England, he was much admired in France. 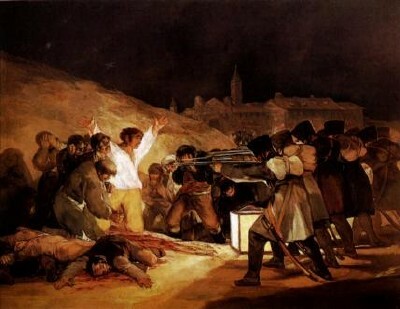 The Spanish painter Francisco Goya (1746 – 1848), subordinated reason for feeling. He was the first painter of the absurd. His foremost influence was Velazquez. In his painting ‘The Sabbath’ or ‘The Great Goat’, he showscross dressing men engaging in a witches sabbath. This was part of a group of paintings that came to be known as the ‘Black paintings’, paintings showing dark and horrific scenes of the degeneration of man,: a subject Goya was fascinated with. 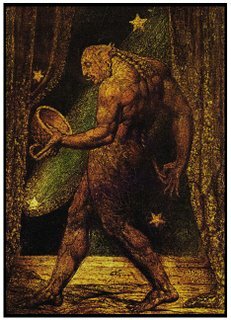 – to the rather grotesque ‘Ghost of a Flea’, which owes something to Goya. 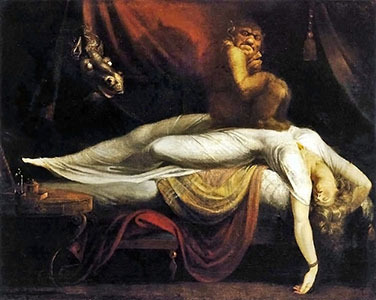 Henry Fuseli (b. Germany 1741 – 1825) taught John Constable, but later ridiculed him. He infused classical structure with completely irrational thought. His painting ‘Nightmare’ contains the stuff which bad dreams are made of…and is also a precursor to Surrealism. In Delacroix’s ‘Liberty Leading the People‘ 1830, we see an emotional approach. One of the main differences between Classicism and Romanticism is that Romanticism shows a way of feeling and Classicism is a way of thought. 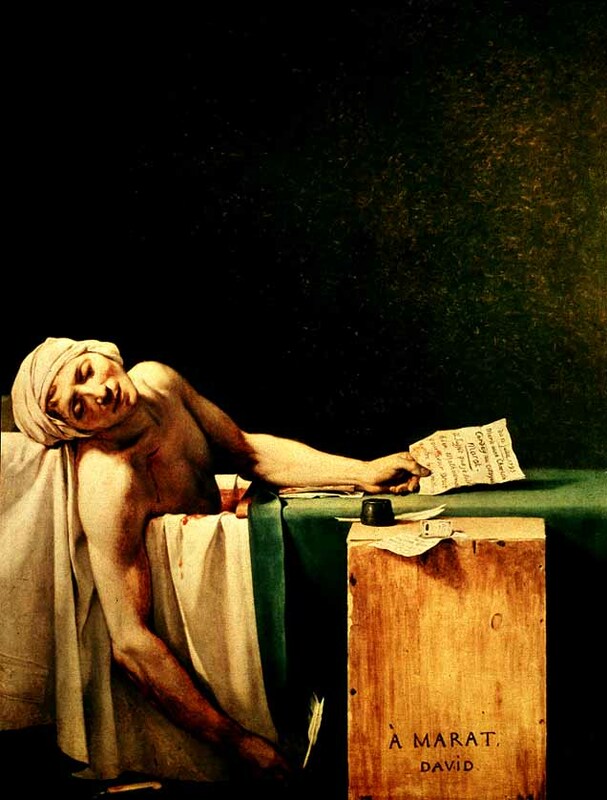 This painting is was used as part of a propaganda campaign regarding the Revolution. 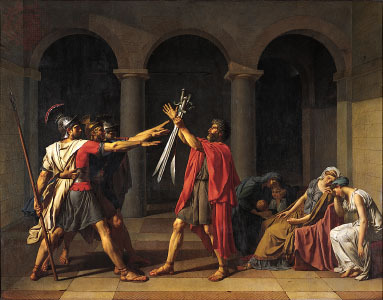 I think that it is in some ways similiar to Jacques Louis David’s ‘Oath of the Horatii’, as it calls the country’s people to arms. 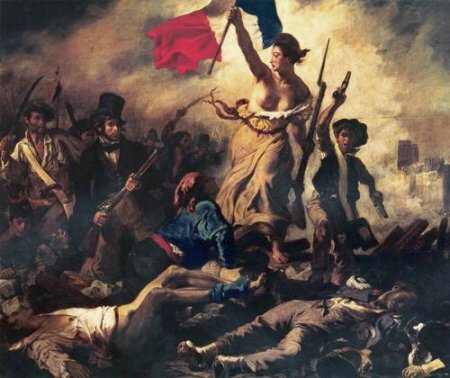 But the main difference between the way that the artist’s do this lies in David’s use of patriotism, duty and allegiance and the more emotional cry of hope and freedom from Delacroix: the possibility of overcoming injustice. By the use of emotional messages in his paintings, Delacroix manages to unify the peasants with hope and stirs within them, the longing for freedom. 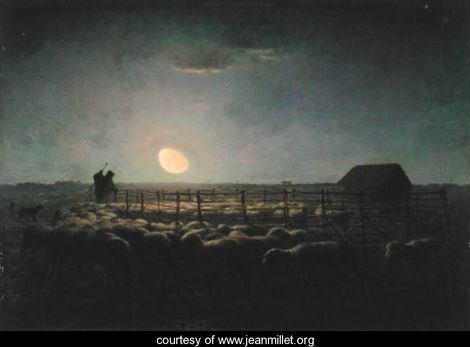 Jean Francois Millet, son of a peasant farmer (1814 – 1875) painted rustic scenes, endowing with majesty the often overlooked aspects of nature. He never achieved popularity in his own lifetime. He had a revulsion for frivolity and ‘told it like it was’. Unfortunately for him, the public preferred the artiface of nature, not the nitty gritty: the wheelbarrows, peasants tending their flocks or field workers. Millet’s emotional response seems to have come from his environment. The abandoned plough in ‘Sheep Fold’ indicates the frustration that man feels when the seasons conspire against him, and also symbolises the life and death cycle that we are all part of. There’s nothing Romantic about Romanticism or is there? What is Romanticism? Romanticism was a movement in the arts that flourished in the late 18th century to the mid 19th century and rebelled against Neo Classicism. 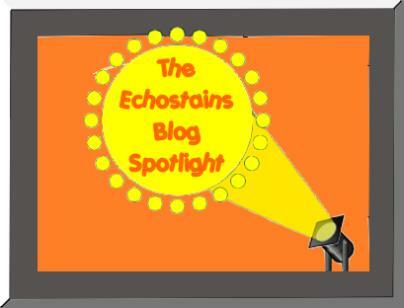 It was the first movement to involve all of Europe in art, architecture, literature and music. 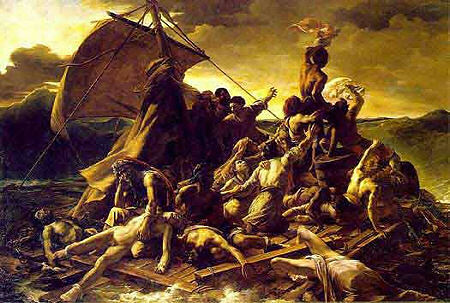 Gericault was right about this as the painting shows a group of well muscled robust men displaying dramatic gestures: gestures that the real victims would not have had the strength to make. 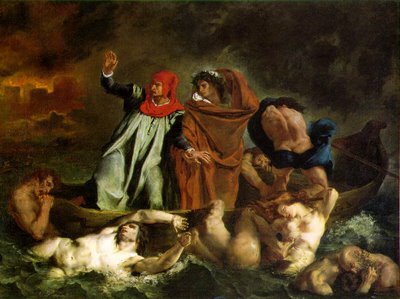 Gericault uses this opportunity to make a political statement about the State. The captain of the frigate, being a nobleman escaped in one of the few lifeboats – leaving the poor crew (149 men and one woman) to built a makeshift raft. The painting which incorporates a ‘pyramid of hope’. The triangles within the picture symbolises the progression from the depth of despair to a apex of hope (the man sighting a rescue ship) at the top of the picture.